Spain is More employs locals who know the mountains like the backs of their hands. Their recommendations, warnings and lessons together with our own extensive experience are all summarized in the accompanying guidebook, giving you a safe and special experience. With this knowledge we created this unique hike through the Northern Spanish Picos de Europa mountain range, and included some nights in Bilbao and on the fabolous Green Coast. Traversing the most desolate parts of the Picos de Europa Mountains is no small task and during the four days of trekking, hikers will cross the mountain range twice. This includes overnights at four charming mountain hotels. The trip is an unforgettable journey through some of the mountain chain’s finest regions (hiking routes vary with difficulty from intermediate to difficult over all passages). Your vacation combines two days in Bilbao, where you’ll marvel at the impressive Guggenheim Museum (among other treasures), followed by two nights at the glorious Green Northern Coast of Spain. The Picos de Europa (Europe’s peaks) mountain range is a well-kept secret as Spaniards lovingly watch over and preserve its authentic charm and quality. The region’s vast beauty is not only ideal for an active vacation, but also provides a gastronomic treasures, where the delicious local cuisine activities between meals. On this selfguided trip with Spain is More, you stay two nights in the best hotels in terms of authentic charm, local cuisine and superb service. Delve deep into the mountains and soak in the most lush and pristine sites. It is also a trip where you must respect the forces of nature and not wander off without properly preparing yourself. Spain is More ensures that you will be well outfitted and ready for surprises that may arise. Travelers will see valleys, mountains and lovely alpine villages and will cross the mountain range at least twice, following one of the most famous of the official trails, the Ruta del Cares. This four-day hike with a backpack requires reaching a new goal each day. Store the rest of your luggage at the mountain hotel where you stay overnight before and after the four-day hike. Spain is More provides maps, trekking-GPS, hotel bookings and other details so you can concentrate on enjoying nature. The tour combines two nights on the preserved, lush northern coast, with some of Spain’s most pristine beaches, and a variety of thrilling sites for everyone. The coast specializes in fish and shellfish in contrast to the mountains where cheeses, meats and beans are standard fare. An amazing trip where pictures speak louder than words... (see pictures above). On the way to the mountains you'll find interesting old villages, stunning beaches and picturesque churches and monasteries. These exciting sites can be found in Spain is More guidebook. Picos de Europa provides plenty of mountain fun before tomorrow’s active hikes, including a pool, good food and stores to buy supplies for the four-day hiking trip. During the first three days, there are no supermarkets, but you stay at cozy little mountain hotels where an attentive “mother” stands in the kitchen, so you will not go to bed hungry. (13 km. easy hiking) The luggage can be left at the hotel, and you will only need to bring a few possessions for the hike. The trekking-GPS will be handed over at the hotel, and need to be delivered back after the hike. From the hotel you'll drive to the end of the Valle de Liebena valley, to Fuente Dé. A gondola takes you up to 1,800 meters (5,900 feet) where the hike begins. The first hike passes one of most stunning mountain massifs of the Picos de Europa, through valleys, plateaus and high passes. The stage ends in the small mountainvillage Sotres, which has some good restaurants to pamper yourself after the hike. The stage is short, only aprox. 10 km. (6,2 miles) but with a steep descent. There are easier alternatives, which are described in the guidebook. You stay in a small secluded mountain town inaccessible by car. Enjoy the local country kitchen and the huge mountain ranges surrounding the village with breathtaking scenery few places can match. (23 km. easy hike, stage can be splitted in two) Today we’ll explore one of Spain’s most famous and precious hiking trails, Ruta del Cares. The route passes through a deep canyon where mountains tower high on both sides of the path. You feel miniscule compared to the large dimensions around you. Stay overnight in a small mountain village hotel where the view and the well-deserved dinner are unbeatable. (9-12 km. let to difficult hike depending on route choosen) Cross Picos de Europa again toward the starting point via the steepest climb to the tour’s highest point. From the top, views are phenomenal (weather-permitting) and after the well-deserved climb, eat a pack lunch leisurely before heading toward the valley, back to the starting point. That night, stay overnight at the same hotel as the first night in the mountains. Guests can either choose an extra night in the mountains or spend the next two nights in a lovely setting on the coast. The Spanish coast has a wide range of fabulous attractions, beautiful coastal towns, wonderful restaurants, fantastic beaches and lush countryside offer limitless opportunities for marvelous adventures. You will stay at a lovely hotel in a coastal town to provide rest and reflection on your impressive hiking achievements. From 875 EUR/pers. Per person in a double room. 9 x nights in double room in stunning hoteles selected for their quality, location and authentical charme. The price includes 1 Spain-is-More-Travel Guidebook per every 4 travellers. More copies can be purchased when booking for 20€ per copy, or 30€ per copy if the request is less than 6 weeks prior to departure. Teleférico Fuente Dé - (one way only). Personalise your trip: Extended stays, transportation to startingpoint from anywhere in the world and back, add interesting and authentic experiences etc. Please ask us, we will be happy to assist you. Car rental: Please, ask for price, if you prefer a different category. 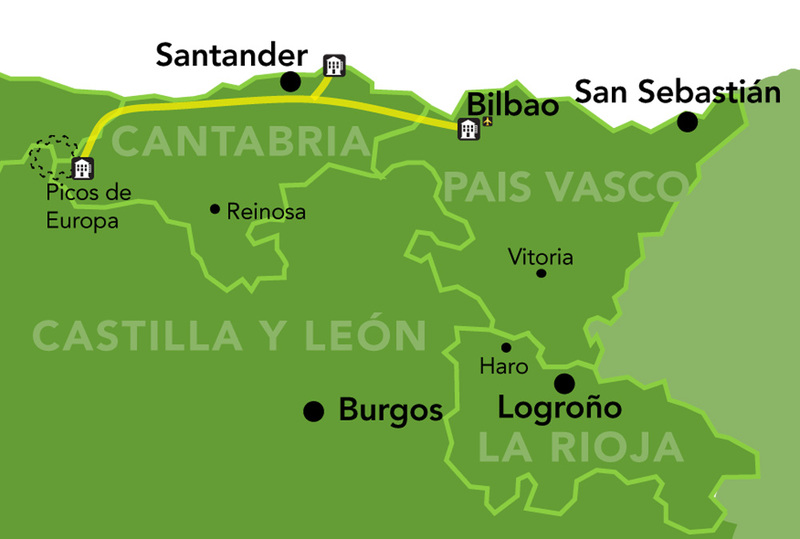 Extension of stay in Bilbao, Picos de Europa, The Green Coast etc. can be arranged.